Social topic might have another interesting turn. During few days off I had last week, I was reviewing unread social feeds and found an interesting article speaking about new Google+ feature – an additional security layer. New configuration of domain restricted communities can insure only people from a specific organization are able to join. Google is clearly striking against Microsoft Yammer features that are going to be embedded into SharePoint. Here is the TheNextWeb article. It provides a glimpse of what Google+ does. Here is the passage I found very important if I think about PLM, engineering and manufacturing. Yet it goes further than administrators merely being able to set restricted communities as the default for the whole organization. Employees can also choose to create communities open to people outside of their domain, so clients, agencies, or business partners can join in the discussion. Once a community is created, an employee can share files, videos, photos, and events from Google Drive. Community owners can change settings, manage membership, or invite other team members to join. The ability to add people from outside of the domain can make new feature applicable for supply chain communities. Work connected to Google Drive with the ability to share large files can help to share CAD files and other information. Google Enterprise blog article Private conversations with restricted Google+ communities provides more information and screen captures. Google article helps you to understand types of communities and access layers that can be created – open, private and public. 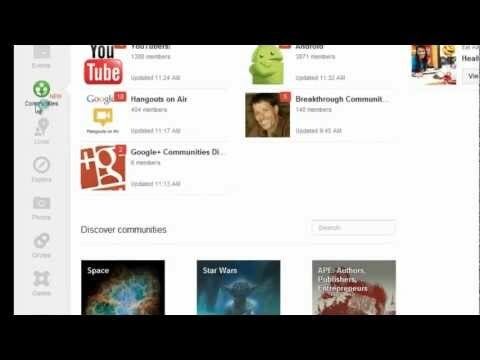 I found a short video which demonstrates Google+ private communities. Yes, and the next thing you know is that while your team members are busy with your extra-secret drone development project for the French government, you receive targeted advetising about SW or HW components you may want to add to the drone to stabilize its flight pattern … right from your major US competitor! Don’t forget that Google reads all content you put on their platform, and all content in hyperlinks published in G+, and extracts relevant information to offer for sale, and to hand over to the NSA if required to do so.